Don't mean to boast but many people think I have very nice hair (see my look book HERE). But Mama told me it's time for me to get a new hair so Papa started styling my hair. Papa, I depend on my hair for a living one, so please handle with care ya..
Hmm I am not sure about my new look. Some said I look even more like Jiu Jiu now. What do you guys think? ur way cuter than your jiu jiu. pssst...my mei-mei not out yet so if you're back this weekend, i come see you ok?! and we go swimming together with baby liv yea?! pray my mei-mei only come out next week! 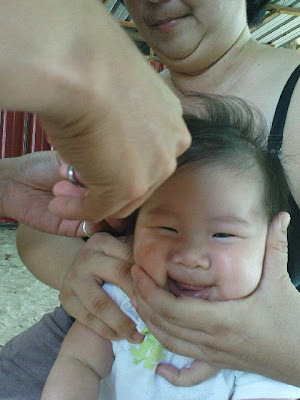 if u wanna c how fat my mummy is, go to http://synneeq.blogspot.com/ and scroll down. u will c me there 2! I only met your Jiujiu and I also think you are cuter, la! Oui, oui! lets all go swimming next week! You are no fat mummy Synnee! You should have seen my mama! Papa was calling her Boom Boom! She was a ball! haha! We love you too JiuJiu!